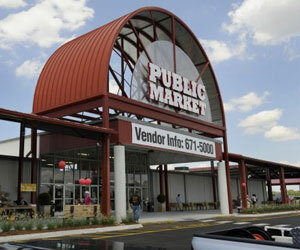 If you haven’t checked it out yet, I encourage you to stop by and see the Turkey Creek Public Market. I have been twice now and I think it’s a gem for Knoxville. I love it most because within one space they have a wide variety of items across the shopping spectrum. Inside they have Goodwill, local farmers, crafters, all the way to upscale interior design stores like Gift, Gourmet and Interiors. My experiences have been very pleasant with friendly shop owners, lots of great booths to shop, and easy parking. Bring cash, not all vendors take credit cards.